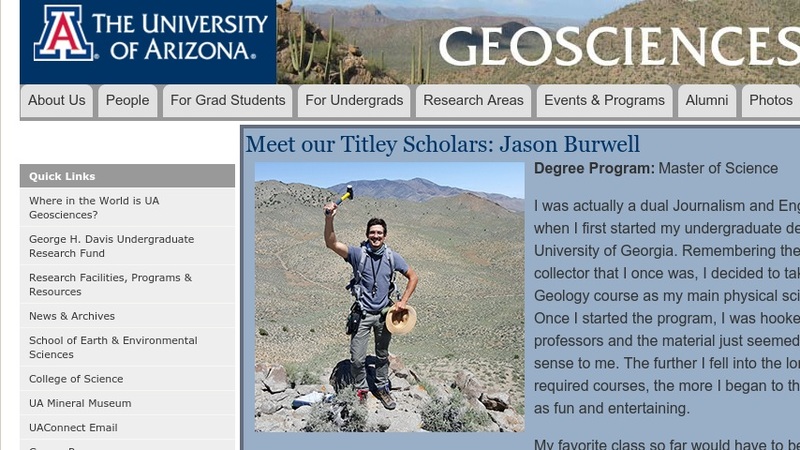 The Department of Geosciences at the University of Arizona addresses the wide range of research activities "dealing with the nature, genesis, and history of the Earth and its crust, and with the evolution of the environment and biota at the Earth's surface." The expansive website illustrates the department's many programs in three major categories: the Solid Earth, Earth Materials and Chemistry, and Earth Climate and Ecosystems. Users can view wonderful images of the researchers working in various areas throughout the world. Students can discover the advantages of becoming a geoscientist and can find countless ways to become involved in this field of study. With such an abundance of geology-related materials and links provided, anyone interested in the geosciences will benefit from visiting this website.